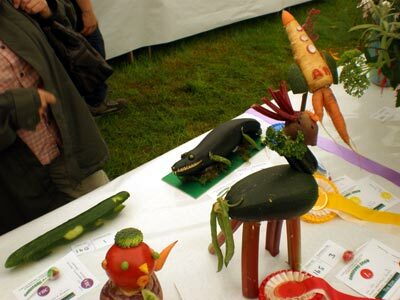 Went to the Garstang Show today. Bit worried the car would be stuck in the field but it was pretty dry. The bulls are creatures of awe bellowing at the cows, not sure what it was about but imagined. Horses, sheep, miniature goats, bantams, rabbits, dogs, budgerigars and some alpaca they’re all there. The miniature goats had quite a following and made quite a nice squeaking sound. Enjoyed the country tent with the vegetables, flowers, cakes and childrens work. Cheese tent as well. The children in Garstang did a great job with those displays. Especially the poems, miniature gardens and drawings. There was a nice crocodile made from a cucumber and several excellent drawings of grandad and grandma and other good ideas. The food tent was good as well. Nice looking pies, jams and other good stuff. Quite fancied a hot pot in the Eden Valley tent but my wifes a vegetarian and so we went to separate stands. The Womens Institute tent had a lot going on and learnt the Roman name for Garstang but forgot it. Had a coffee in the Methodist tent. Overall a lot going on and stayed a lot longer than intended.